Rey and Poe are tasked by the Rebellion to locate the First Order’s new “War Star,” a gigantic planet sized base that is capable of draining the energy from a sun and using it to blow up ten planets simultaneously. To gain entrance to the FO base, they will need to locate Darth Vader’s glove, a powerful Sith artefact that allowed Vader to choke people at a distance by gripping his hand tightly. It is currently in the possession of Clip Asbo, an intersteller Transdoshan artefact collector who lives in Kubla Khan style pleasure in his palace on Jectine, and who runs the Transport Guild, the second most powerful force in the galaxy after the first order. Rose and Finn are working with the remainder of the Resistance, now renamed “The Rebellion”, to eliminate the Manufactory of Plornect, which is producing the first of the First Order’s “Claymore” class Star Destroyers. Unlike the traditional triangular ships, this one is a round cylinder, and appears to be basically a gigantic lightsaber. The elegant and civilized design will allow the ship to destroy entire fleets with a single sweep, rather than firing chaotically, simply rotating its “blade” across the field. Meanwhile, Phasma’s daughter, Phasma II, princess of the stormtrooper tribe is chosen to avenge her mother, and she has even cooler gold-chrome armor. She is paired up with the mysterious Zekk “Jade” Fel, the apprentice of Kylo Ren, They are regularly taunted by Ren for their failures, with him constantly showing up as a huge hologram and telling them how much they stink. Unknown to everyone, “Jade” is the son of Luke Skywalker, but Luke does not know this. Rey and Poe’s mission is complicated by Poe’s evil brother, Joe Dameron, and there is an awesome space battle between the Millennium Falcon and Joe’s Hex-Wing fighter (It’s like an X-Wing, but it has an extra set of wings like this ⚞⚟). The force ghost of Princess Leia appears to help them during this battle, revealing to Rey that, because Han had “adopted” her as his honorary daughter before his passing, she now possesses legal claim to the throne of Corellia, as well as that of Alderaan. Once the battle is finished, she adds red stripes to the sides of her trousers to signify this honor. In the palace of Clip Asbo, they are shocked to learn that his son, Clorr, has murdered his father and taken his place as head of the transport guild. The First Order has been bad for business, you see, and if you aren’t expanding, you’re dying. Not realizing its true value, Clorr tosses them the “worthless” leather glove as a gesture of bonding and respect, in exchange for Poe’s new jacket (“I just can’t seem to hold on to these things,” he quips in an aside to Rey). After a series of daring twists and turns and near misses, Rose and Finn sneak aboard the “dry docked” claymore-class ship, “The Mutilator”, and proceed to hi-jack it with BB-8’s help. Phasma II and “Jade” arrive moments after they have jumped to lightspeed, and Phasma II slams her force mace into a console dramatically, sparks flying everywhere. With the stage set, our heroes converge on the War Star. Poe and Chewy engage the First Order Star Fleet, led by Joe in a newly souped up ship that now has TIE Fighter wing plating over the movable plates of his Hex Wing, and that at one point he dramatically disengages to increase his maneuverability, ala “I’m not left handed either” in the Princess Bride. Rey, wearing the Glove of Darth Vader, fights a Darth Vader-helmet wearing Kylo to a stand still, the two artefacts boosting their Force powers to levels never before seen on screen. “Han’s legacy is mine!” Kylo shouts. “No, it’s not too late for peace!” Rey responds. Rose and Rebel code slicer Kylie Andor-Erso rush to hack the system and delete the code holding the War Star’s shields in place, preventing Finn from destroying it with the Mutilator. In the world of the Imperial CodeNet, they engage in a battle of wits with DJ, who attempts to outwit them at every turn, taunting them with a laughing avatar of his face rendered in monochrome green (a reference to the LucasFilm’s logo), while Rose and Kylie’s monochrome blue avatar (in reference to the “A long time ago…” part of the opening crawl) battles it symbolically with a lightsaber. Smash compare cut back to Rey and Kylo, battling across the throne room of the War Star, destroying railings, hurling boulders, exploding glass. And then, a third man enters, wielding a green lightsaber. “Neither of you are worthy,” he declares. “What do you mean, my young apprentice?” Kylo asks. “Jade” does not respond, and instead enters the battle, the three way lightsaber duel all the more fierce because no one is on anyone else’s side. Force Ghost Luke appears, so he can give Rey aid, but he is shocked to see both Kylo and “Jade” there. “You… You killed my son!” Luke yells. “No, I am your son!” “Jade” responds. “No! No, that can’t be true!” Luke shouts. “Search your feelings, you know it to be true!” “Jade” tells him. “Don’t worry little buddy. Let’s blow this thing and go home!” says a familiar voice from off screen, and force ghost HAN SOLO appears, and it looks like the tide is turning for the good guys! But then, Snoke reappears as an evil force-ghost and threatens to destroy them all. Ghost-Luke and ghost-Han merge into ghost-Huke Skolo to fight him. “Run, Rey, Run!” yells the mega-force ghost as the battle brings the fortress down around them. She leaps into the nearest fighter possible and accelerates off planet. Kylo and Jade’s fates are left ambiguous. Rose and Kylie bring down DJ’s force shield. Poe manages to slip behind Joe and blast one of his wings, sending the fighter sailing off directionless into space. The War Star is destroyed by the huge blue lightsaber beam slashing through the planet, cleaving it in twain. At last, the Star Wars are over. On the planet Corsucant, our heroes are honored in a lavish ceremony celebrating the freedom of the Galaxy. Fireworks explode over various planets from the movies, and we zoom in to the credits with John Williams’ familiar heroic theme playing us out. BUT, in an after credits sequence, we are treated to Joe Dameron’s one winged ship crashing on a desert planet, ala The Force Awakens. He escapes from the ship, barely, and struggles to run before it is swallowed up by the sand. After wandering for a series of cuts that we are meant to interpret as a long time, he is ambushed from behind by a woman in a familiar set of golden armor. “Hello Joe,” says Phasma II. She leads him back to the largest hut in the stormtrooper village, where, on a throne built of the helmets that the troopers wore in A New Hope, sits a burned and cyborg augmented Captain Phasma! Her armor is damaged, but she is still clearly alive and angry. “We were wondering when you’d arrive,” she says. “Now, it is time to create the Second Order.” We cut to black on her last two ominous words. 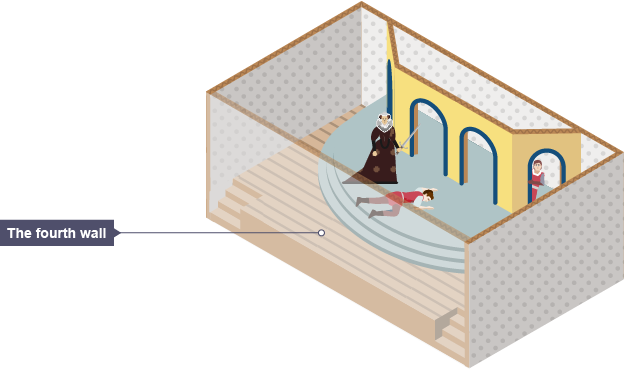 They are one of the most common types of theatre, along with prosceniums, thrusts, and arenas. They are highly configurable, because all they are is a room painted black, and both the seating and set can be placed where ever one chooses. 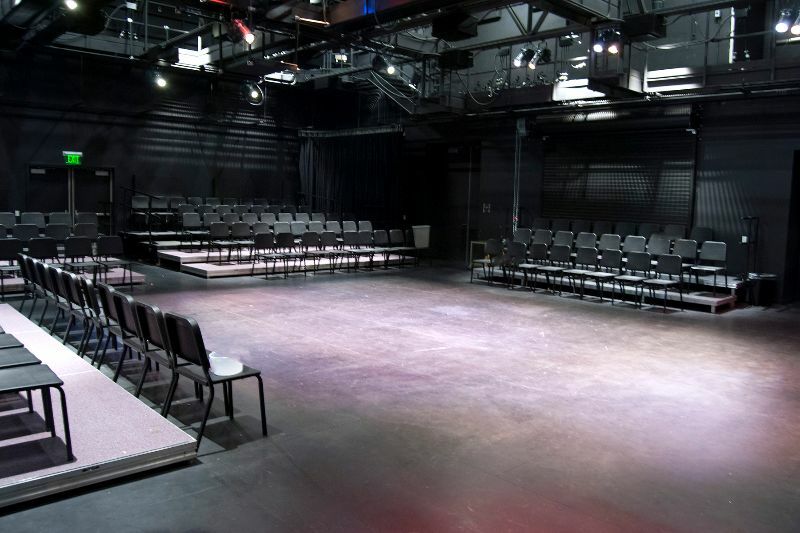 Much black box theatre is performed with either minimalistic or no set, and minimal costuming. Everything from very traditional Shakespeare or Greek tragedy, to very modern experimental or absurd theatre can performed black box. The audience uses their imagination to fill in the blanks, and the show goes on. The actors, meanwhile, get over themselves and do their damn jobs. They idea that you can’t act against a blue or green screen is patently false. Even on a very built up and detailed set, there’s this thing called the Fourth Wall. It’s the one that the audience sees through into the action. 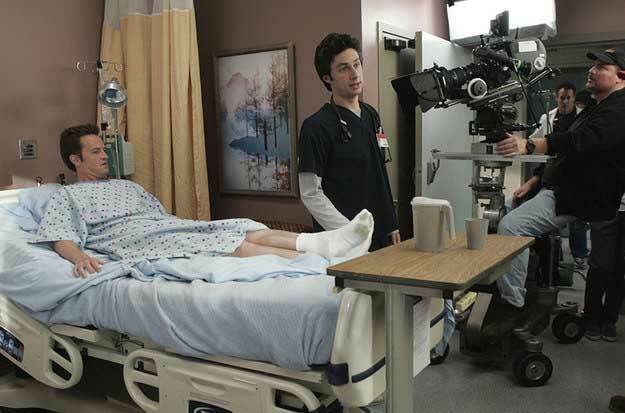 In modern one camera filming, the cameras will often be directly in your face, over your shoulder, between your legs, kneeling in front of you shooting up your nose, or in a myriad of other very close positions. There is never a moment in which you are not aware that you are acting. 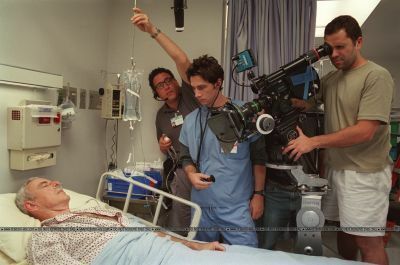 Scrubs was filmed in an actual hospital, but even then, it was chockful of camera people and assistants and such. You get over it and do it anyways. The idea that “Oh, if only they’d had more real sets!” is garbage. You can even act with something that isn’t there. There’s an entire movie where Jimmy Stewart’s co-star never makes an appearance. It’s widely regarded as a classic. Acting is a learned skill that takes time and effort, and not some magical gift granted by the gods. A young man steps into the hanger, accompanied by the wizened old mentor who has told him of his mysterious past, and the two slaved that have brought a mysterious message that could save the world. The young man has just sold his speeder, a vehicle that he treasured, but that he acknowledges is no longer in demand since a newer model came out. The old man has assured him that it will be enough. We see the star ship that they will fly in: it looks nothing like the traditional rockets we are used to in science fiction, nor the “space plane” that we see from real life space exploration. Even in contrast to the other ships we have seen thus far in this world, this one is unique: unlike the Tantive IV or the Devistator, this ship is flat, more like a pizza or a hamburger, with a cockpit stuck awkwardly onto the side, and a loading platform more like that of a cargo plane. “What a piece of junk!” exclaims the young man. There’s a moment in most Steven Spielberg movies where, upon seeing the object of wonder (the dinosaurs, the aliens, the bicycle flying), we cut back to the people watching react. We see the children’s faces in awe, the parents with mouths agape, the government agents shocked and in disbelief. The film tells us what reaction we should be having. Yet, we are all taken in by Han Solo. Luke, who is shown to have a strong interest in spaceships, is planning on attending the Academy to become a pilot, is later in the film shown to be quite a competent pilot himself, says the Millennium Falcon is a junk ship. When Han tries to justify the condition by saying that he’s made a lot of “special modifications”, Obi-Wan simply rolls his eyes. This isn’t the first time that Obi-Wan hasn’t been taken in either. Take the famous “Kessel run in less than twelve parsecs” exchange in the cantina. Much ink has been spilled to justify that a parsec is a measure of distance, not time, and therefore the Falcon must have a very efficient navigational computer, or Han is much better at piloting than others, so in a treacherous environment like the area around Kessel, he must be able to blah blah blah. Almost no one considers that he’s a smuggler and con man who is trying to talk up a potential client, and saying whatever comes into his head to impress them. It’s much like his later bullshitting about a reactor leak caused by a slight weapons malfunction and that he needs a few minutes to lock down. Large leak. Very dangerous. This is not a man taken in by fancy words. He knows Han is bullshitting him, but he doesn’t have much choice, as he’s in a time crunch and needs to leave right now. Better a thief than a stormtrooper. Han then proceeds to kill a debt collector, shooting him under the table (not unjustifiably, as Han was being threatened), unlike Obi-Wan, who merely maimed the thug who was bothering Luke, and tried to deescalate the situation first. But the idea that Han Solo is a good person, is introduced to us as a hero, is from the get go a role model? There’s little in the film to support this. He gets his money and runs, just like he said he would. And this makes his return at the very end to save Luke, and therefore insure the destruction of the Death Star all the more heroic.